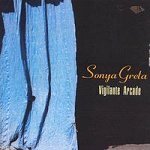 Sonya Greta has released a lovely folk recording; it’s also her debut. The guitar is her main instrument but there’s much more than that here on the recording. The songs are nicely written, unique, well-thought out. Greta’s voice is deep, and soothing, while at the same time gutsy. It’s a very homey feeling one gets when listening to her sing. Her guitar style at times reminds me of Dar Williams. Some finger picking as well as strumming. At times the songs recall Audra Kubat (Happiness) and Joan Baez (I Don’t See You). The title track, “Vigilante Arcade” is very catchy. A little bit country, a little bit rock-n-roll (but nothing like Donny & Marie…is anyone out there old enough to get that or is it just me?). Cool song. “Ode to Mrs. Pontellier” Her use of dissonant chords and making the song go places you don’t expect are what gives it a really interesting, almost sad feeling to it. Even before listening to the lyrics. “I Don’t See You” is another beautiful song with it’s eerie background vocals and soothing guitar parts, I want to just close my eyes and dream. She closes the CD with “Direction” which adds the piano and more full instrumentation and production and it comes out very nicely. It’s hard for me to choose a favorite track because they all have something lovely to offer. Fans of the above-mentioned artists, especially Kubat owe it to themselves to check this out.